Are Egg Beaters Better Than Eggs That You Beat? Snack Girl loves trying out food products to see how they rate. A reader asked me about Egg Beaters and I had never tried them. 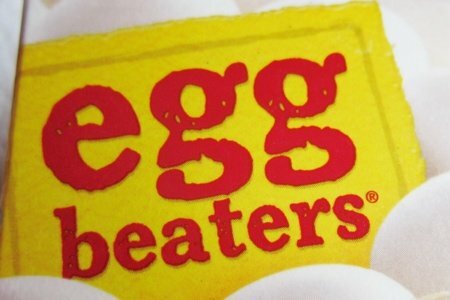 Egg Beaters, in case you didn’t know, are manufactured by ConAgra. They are primarily egg whites with added flavorings, vitamins, and thickeners to make them like real eggs. Regular eggs are produced by chickens and I hope you have identified a local brand to ensure that you get the best and freshest eggs. First, I had to evaluate their taste. I know how eggs taste because I eat them all the time, but I had never had Egg Beaters. I decided to go with a yummy looking recipe I saw on the Egg Beater website: Bacon and Cheddar Egg Mug Scrambler. You know, I liked it. I was surprised that anything I would pour out of a carton would really be like an egg – and this worked. Was it as good as a farm fresh egg? No, but it didn’t have a weird after taste and it looked like an egg. Is this the robo-food that Michael Pollan warned you about? Actually, I don’t think that egg whites, spices, and added vitamins and minerals is really that terrible. What I do think is that a regular egg has the nutrients packed in it with the fat and that nutrient uptake by your system is facilitated by fat. In other words, you might not get the same amount of nutrition from the Egg Beater as from a regular egg. I doubt anyone has done a study. As for the cholesterol, the American Heart Association says that you can eat eggs in moderate amounts (1 per day) as long as you keep the rest of your animal protein consumption in check. The link between dietary cholesterol and heart disease is under debate. My suggestion (if you want to cut calories with Egg Beaters) is to hedge your bets. Mix a regular egg with some of the Egg Beater to get more volume and less calories. What do you think of Egg Beaters? Please share. I'm glad to hear you approve! Eggs can upset my stomach if I eat them early in the morning so I often use egg beaters instead, and I think they're pretty yummy. They make a delicious omelette with spinach and feta cheese. I like the idea of mixing them with real eggs. I like to use eggbeaters with the flavoring included for omelets. I can add more to the inside of the omelet (cheese especially) with the calories I save on the eggs. Love Egg Beaters. I have eggs as a "treat" on some mornings but at home it's always Egg Beaters. I had very high cholesterol issues and when I switched over to this while overhauling my eating habits, the numbers dropped big time. The taste is great, and it's so easy to serve. No egg shells to crack or yolks to remove. I usually mix one egg with a half serving of EB. Or sometimes 1 or 2 egg whites and some EB. Real food = real eggs = straight from the hen. Cartons? Eggs don't come from cardboard containers. I have a carton in my fridge, but haven't tried them yet. Curious -- can you use Egg Beaters as an egg substitute in baking? I wonder if that would alter the cakes or cookies or whatever. Egg Beaters ingredients are better than I thought they would be. In a pinch, I might use it. I am, however, wary of the word, "Spices." What is that, actually? Some people also choose to avoid Maltodextrin (processed from wheat or possibly GMO corn). I love Egg Beaters and use them all of the time - it makes that groggy, early morning food prep so much easier. Also, I used to hate that stringy thing in the egg white and fishing it out. Tracy - I use them in cooking and baking all of the time, and haven't noticed any sort of difference in the results. I use Egg Beaters all the time, for breakfast and substitutions in baked goods. I never have noticed a taste difference. I can have two eggs with Egg Beaters instead of one with a regular egg. I absolutely love it! I will admit, I'm not a big fan of egg beaters. Instead, I make an omelet with one full egg & 2 egg whites. Then I get the real thing, with not all the "bad stuff" that you might get with too many eggs, and quite a lot of volume. Then you can make it even bigger by stuffing it full of veggies & a little cheese if you wish. Makes quite a filling meal. I have not tried the egg beaters in recipes. What I do is use one whole egg and then some whites with it. This way I get one yolk and the volume of an extra egg. A little more work because you have to separate an egg, but like you say, real whole food with no additives. Have to say I am disappointed you would give any kind of go-ahead for egg beaters. PLEASE NO Egg beaters – they are just pure processed crap. The ingredient “natural flavor” is an industry secret that allows companies to sneak in MSG without labeling it. Both, xanthan gum (a thickener) and maltodextrin (a processed sugar) are made from genetically modified corn. Why do you need those ingredients in your eggs? Because they took out the yolk, which also took out all the REAL natural flavor, thickness and nutrients, that’s why. They even had to add back in vitamins to compensate. Regular ol' eggs are so good for you! Yolk and all, it is good fat and we need good fats! So - mostly egg whites. Can't I just break open a few eggs and separate the whites myself? I can add my own spices (if I want them) and they'd be more fresh. I can handle my own vitamin intake too. In a pinch I'd try this, but I'll stick with my norm: I'm one of the lucky few who know what it's like to pluck an egg from the straw so fresh it warms my chilly hands. I make sure my hens eat well, so I know I am. I used to use EB and got used to them. Trying to cut back on calories and fat. I think it is cheaper to make an egg white omelet, throwing away the yolks, than to buy EB. I hate the waste. I have compromised by making 2 eggs, using only the yolk from one and the whites from both. I like to use Eggbeaters with an egg to cut calories and cholesterol. Like in an omelet, I use an egg and Eggbeaters. I use it in cooking as well, sometimes substituting or using half and half. I never buy Egg Beaters and won't. I have 2 or 3 whole eggs nearly everyday. My blood cholesterol is not and never has been a problem. Eggs are still carrying an undeserved bad rap. Whole eggs have so much nutrition and cage free chickens fed organic foods are healthy with no artificial ingredients just the way they were intended. A certain amount of cholesterol is needed for the body to absorb vital nutrients and offer brain food. The brain is nearly all cholesterol. That is why I think eggs are the perfect food. There are those people that manufacture cholesterol in their bodies regardless of what they eat. Genetics are a prime consideration. I think eggs were meant to be eaten as whole eggs. I believe the egg white and the yolk have a symbiotic relationship as a whole natural food and are healthier that way. I think it is more important not to eat fatty and processed meats and to stop using most vegetable oils that turn to cholesterol when heated for cooking. Since we changed to coconut oil, hubby's cholesterol has reached the normal range. I would bet that those people so concerned about eggs may not be giving a second thought to the cholesterol in the meat they eat which is usually vastly more than a couple of eggs. I have thought about buying these before but just can't get over the questions of...what do they do with the leftover yolks?! To me, that is too wasteful to just dump them. I also wonder about the treatment of these chickens if they are mass producing to get enough egg whites. Sorry to be a Debbie Downer. It is always better to eat REAL food anyway.